I am currently a Research Associate (that is, a postdoc) at the Institute for Geometry and its Applications in the School of Mathematical Sciences at the University of Adelaide. 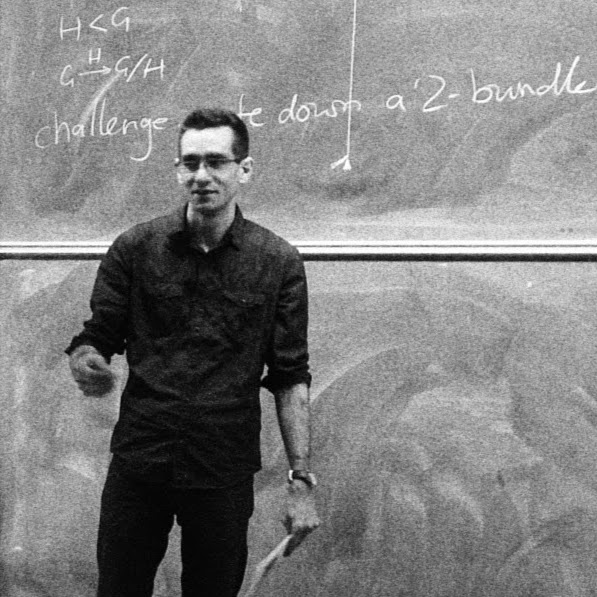 I work on bundle gerbes, 2-bundles, geometric stacks and internal groupoids and categories, and category theory more generally with a side interest in foundations. I have a particular interest in constructing examples in (low-dimensional) higher geometry. Previous to this, for July-2017 to February 2018 I was a Lecturer (=Assistant Professor in the US system) in the School of Mathematical Sciences. I was also a Research Associate at the University of Adelaide from October 2013 to April 2015. You may also find me on: MathSciNet, Google Scholar, MathOverflow, arXiv, ORCiD, Publons, or my blog, theHigherGeometer. Extending Whitney’s extension theorem: nonlinear function spaces, arXiv:1801.04126. Joint with Alexander Schmeding. (Re)constructing code loops, arXiv:1903.02748. Joint with Ben Nagy. Smooth loop stacks of differentiable stacks and gerbes, Cahiers de Topologie et Géométrie Différentielle Catégoriques, Vol LIX no 2 (2018) pp 95-141 journal version, arXiv:1602.07973. Joint with Raymond Vozzo. Equivariant bundle gerbes, Advances in Theoretical and Mathematical Physics 21 (2017) no. 4 pp 921-975, doi:10.4310/ATMP.2017.v21.n4.a3, arXiv:1506.07931. Joint with Michael Murray, Danny Stevenson and Raymond Vozzo. Quasi-periodic paths and a string 2-group model from the free loop group, Journal of Lie Theory, 27 (2017), No. 4, 1151-1177. journal version (paywall), arXiv:1702.01514. Joint with Michael Murray and Christoph Wockel. A bigroupoid’s topology (or, Topologising the homotopy bigroupoid of a space), Journal of Homotopy and Related Structures Volume 11, Issue 4 (2016) pp 923-942, doi:10.1007/s40062-016-0160-0, ReadCube, arXiv:1302.7019. On certain 2-categories admitting localisation by bicategories of fractions, Applied Categorical Structures Volume 24, Issue 4 (2016) pp 373-384, doi:10.1007/s10485-015-9400-4, ReadCube, arXiv:1402.7108. Simplicial principal bundles in parametrized spaces, New York Journal of Mathematics Volume 22 (2016) 405-440, journal version, arXiv:1203.2460, joint with Danny Stevenson. A topological fibrewise fundamental groupoid, Homology, Homotopy and Applications, Volume 17, Number 2 (2015) 37-51, doi:10.4310/HHA.2015.v17.n2.a4, arXiv:1411.5779. The weak choice principle WISC may fail in the category of sets, Studia Logica Volume 103, Issue 5 (2015) pp 1005-1017, doi:10.1007/s11225-015-9603-6 arXiv:1311.3074. The universal simplicial bundle is a simplicial group, New York Journal of Mathematics, Volume 19 (2013) 51-60, journal version, arXiv:1204.4886. The inner automorphism 3-group of a strict 2-group, Journal of Homotopy and Related Structures, vol. 3(1), 2008, pp.193–245, journal version, arXiv:0708.1741. Joint with Urs Schreiber. From cows to inductive types; or, What are numbers?, School of Mathematical Sciences Undergraduate Seminar, University of Adelaide. 5 September 2018. Constructions in lower dimensional higher geometry, Gauge theory and higher geometry, University of Adelaide. 29 November 2017. Constructing differential string structures, Differential geometry seminar, University of Adelaide. 7 June 2017. Smooth mapping stacks of differentiable stacks and orbifolds, Functional analysis seminar, University of Colorado, Boulder. 1 December 2016. Low-dimensional higher geometry by examples, Kempner Colloquium, University of Colorado, Boulder. 29 November 2016. Smooth mapping orbifolds, Differential geometry seminar, University of Adelaide. 20 May 2016. An explicit string bundle, Algebra/Geometry/Topology seminar University of Melbourne, 22 November 2013. An explicit string bundle, AustMS 2013, 3 October 2013 (slides in WriteLaTeX). Proper class forcing, Category Theory 2013, July 2013. See here for a list of student projects I have supervised and courses I have taught. My contributions to the nLab are released under a CC0 license. This is essentially public domain, but works in jurisdictions where such matters are difficult. Normal academic standards do apply, so attribution of ideas where they are clearly mine would be nice. Last revised on March 29, 2019 at 06:27:37. See the history of this page for a list of all contributions to it.